This NASA/ESA Hubble Space Telescope image presents the Arches Cluster, the densest known star cluster in the Milky Way. It is located about 25,000 light-years from Earth in the constellation of Sagittarius (The Archer), close to the heart of our galaxy, the Milky Way. It is, like its neighbor the Quintuplet Cluster, a fairly young astronomical object at between two and four million years old. The Arches cluster is so dense that in a region with a radius equal to the distance between the sun and its nearest star there would be over 100,000 stars! 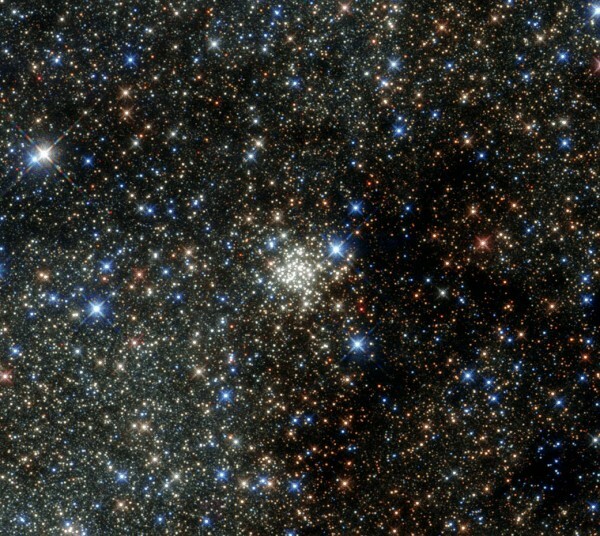 At least 150 stars within the cluster are among the brightest ever discovered in the Milky Way. These stars are so bright and massive that they will burn their fuel within a short time (on a cosmological scale that means just a few million years). Then they will die in spectacular supernova explosions. Due to the short lifetime of the stars in the cluster the gas between the stars contains an unusually high amount of heavier elements, which were produced by earlier generations of stars. Despite its brightness the Arches Cluster cannot be seen with the naked eye. The visible light from the cluster is completely obscured by gigantic clouds of dust in this region. To make the cluster visible astronomers have to use detectors which can collect light from the X-ray, infrared, and radio bands, as these wavelengths can pass through the dust clouds. This observation shows the Arches Cluster in the infrared and demonstrates the leap in Hubble’s performance since its 1999 image of same object.